This photo, unpublished until it appeared here in 2011, was found in the LIFE photo archive by Bill Mullen, but without the details of where or when it was taken. I guessed it was from one of many parades in Central and South American cities, during several trips taken by U.S. President John F. Kennedy to promote his "Alliance for Progress" plan to provide aid and resist Communism in Latin America. 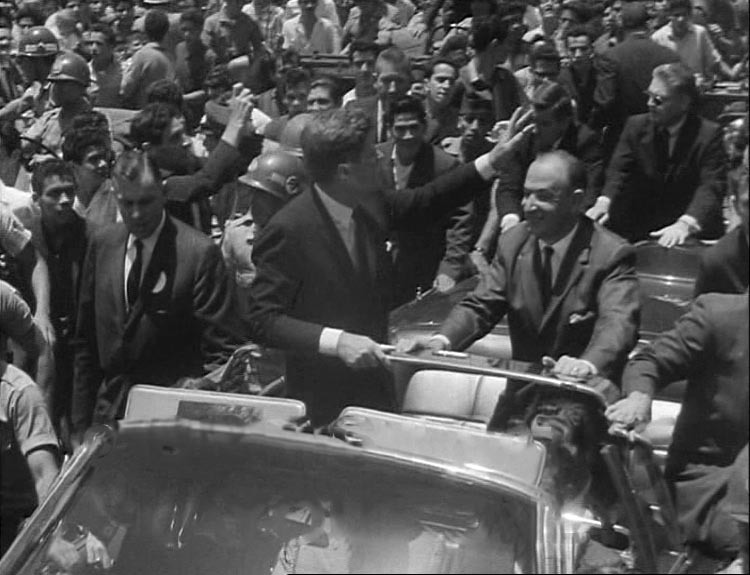 The military uniform in the foreground looked like Mexican Army, but the receding hairline on the passenger beside JFK clearly did not belong to Mexican President Lopez Mateos. 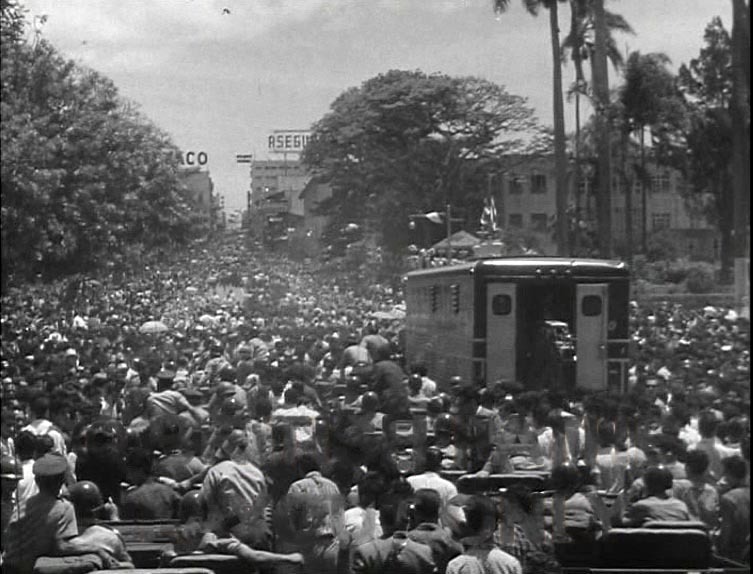 By comparing the photo to a number of other pictures and newsreel video clips, I was able to determine that the photo was taken in San José, Costa Rica on 18 March 1963. JFK was there to address the "Presidents' Conference," a meeting of Central American leaders, devoted to the goals of the Alliance for Progress, improving economic cooperation, and isolating Fidel Castro's Cuba. It has been reported that a de-classified CIA document indicates there was a suspicion that pro-Castro fanatics would try to assassinate Kennedy in Costa Rica. Secret Service agents in the photo are wearing white lapel badges. 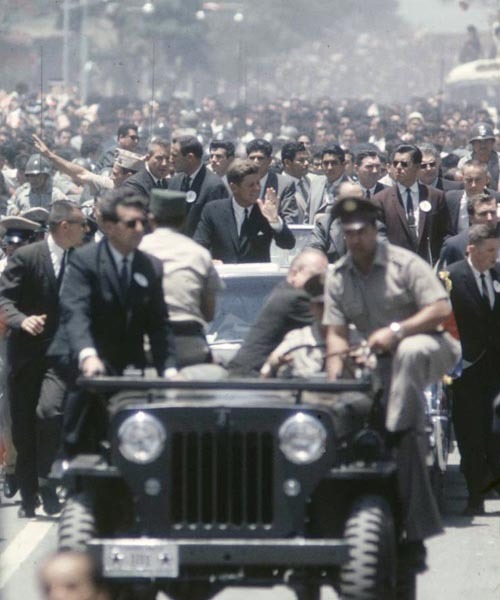 One agent rides on a side step of the M606 Jeep preceding the President's Lincoln. 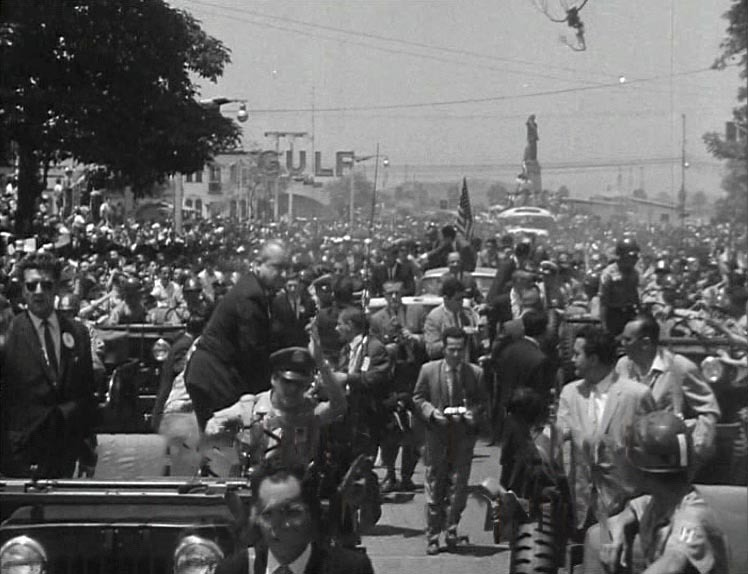 Final confirmation of the date and location of this parade came from the newsreel "President Kennedy In Costa Rica 1963" at British Pathé. 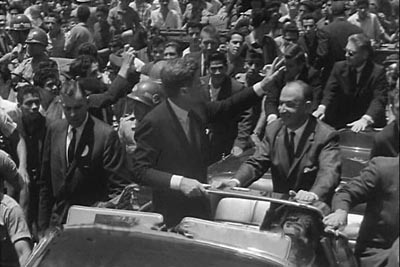 It shows Costa Rican President Francisco Orlich Bolmarcich beside Kennedy. In the background are members of the Costa Rican Civil Guard, in Jeeps and helmets donated by the United States. 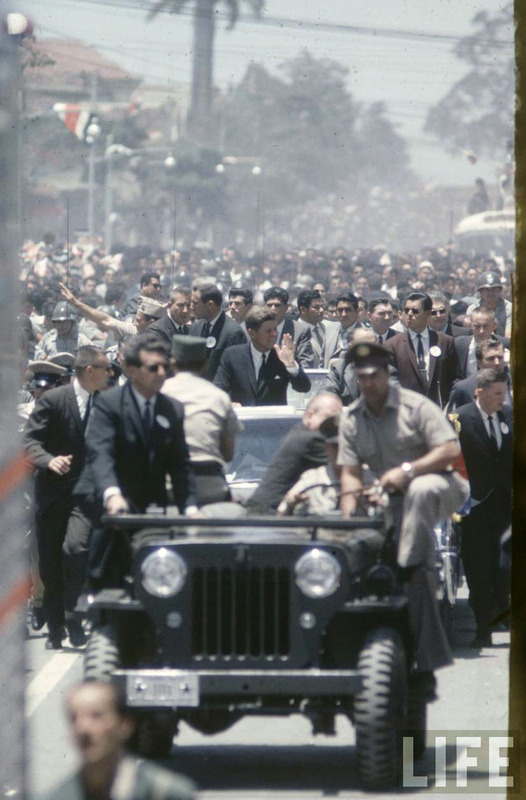 Just behind JFK's right shoulder can be seen a helmet still bearing the "black panther" insignia of the U.S. Army 66th Infantry Division, which was adopted by the Civil Guard and then used for many years by the Reserva Fuerza Pública. Another shot clearly shows lines of Jeeps on the left and right sides of the motorcade; the President's car was basically surrounded by Jeeps, outside the immediate perimeter of Secret Service protection. The driver of the point Jeep is gesturing in an apparent attempt to get things moving faster. The reason for the slow progress is obvious in the next shot below, taken from the rear of the procession. I was surprised to see the large number of Jeeps involved; Costa Rica has not had an army since 1948. But Milton Valerio told us in 2013 that "these were members from the Civil Guard (police) and the police reserve, which was the last remnants from the extinct army. The Jeeps, helmets, etc. were also remnants from the 1948 civil war and 1955 armed conflict, mostly donated by the U.S.
"Urban legend says that these Jeeps were in use until the late 80's, and then former president Oscar Arias Sanchez gave an order to throw into the sea all those 'horrible military machines,' in order to buy new 'less military' cars for the police. A few were saved from the bottom of the sea, but what we really know is that very few survive today." 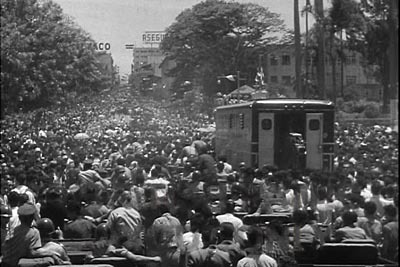 According to an article in LIFE , 29 March 1963 about Kennedy's trip, "A wild parade down Avenida Central looked like the down-the-street corridas at Pamplona when more than 200,000 Costa Ricans ran jubilantly behind, beside and practically on top of the presidential car, completely overwhelming curbside guards of uniformed schoolchildren linked hand in hand." The photos in the LIFE article were taken by John Dominis, so it's likely the picture at the top of this page is also his work. John Dominis photographed many events of the 1950s and 60's for LIFE , including Vietnam and Woodstock, and later became an editor at People and Sports Illustrated . He died in 2013. Incidentally, one of JFK's advisors on Latin America was Hickman Price, vice president of Willys Motors, who had established overseas operations including Willys of Brazil. 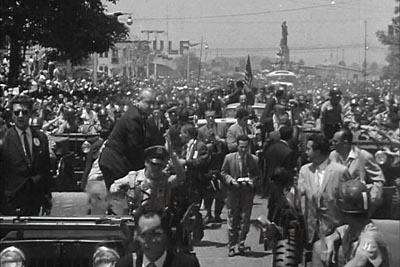 By 1963, Price was serving as Assistant Secretary of Commerce, and was probably present for this parade. See more on Hickman Price in Israel Jeeps on CJ3B.info. While JFK visited San José, the nearby Irazú volcano was erupting -- see Volcano Watching in a CJ-3B. Also on CJ3B.info, see Krushchev Visits Indonesia, 1960. Return to CJ-3Bs in History, or see more M606 Military Jeeps.